Future iPhone OLEDs likely won't come only from Samsung, as Bloomberg reports a new deal with LG will split the responsibility. Apple will reportedly use LG displays for upcoming iPhone OLEDs. If true, this would limit Apple’s reliance on Samsung for the expensive OLED technology. This would be a win for Android devices as well, as it would mean price drops for OLEDs industry-wide. Apple and Samsung may be bitter rivals in the smartphone world (even if they did recently call a truce), but that doesn’t stop the companies from working together to create products. For example, the iPhone X’s OLED screen is created solely by Samsung. The expense of that OLED is one of the reasons why the iPhone X starts at a whopping $1,000. In an effort to put Apple in a better-negotiating spot with Samsung, the company is reportedly going to use OLEDs manufactured by LG for some of the next round of iPhones coming this fall. This information comes from an anonymous source speaking to Bloomberg. According to the source, LG will not supply all the OLEDs for the new iPhones but start with at least 2 – 4 million displays. LG reportedly wanted to be the sole supplier, but couldn’t ramp up production in time to meet Apple’s needs. That means some of the displays in the upcoming iPhones will be made by LG, and others still made by Samsung. 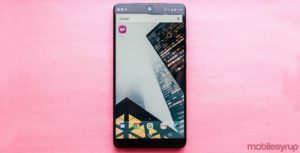 This partnership is terrific news for LG as it fights off both the sliding prices of LCDs and its own problems with its smartphone business. It’s also a win for Apple as working with a second OLED supplier will force Samsung to lower its prices for its own displays. But Android smartphone enthusiasts are also winners with this deal because if the prices of OLEDs come down, that means more smartphones with OLEDs at lower prices. Industry rumors suggest that Apple will release three new iPhones this year, all of which will look like the iPhone X with a notched, chin-less display. One device will likely be a standard successor to the iPhone X (iPhone X2, maybe? ), another could be a larger iPhone X (iPhone X Plus? ), and the third might be a cheaper model (iPhone X SE? ).